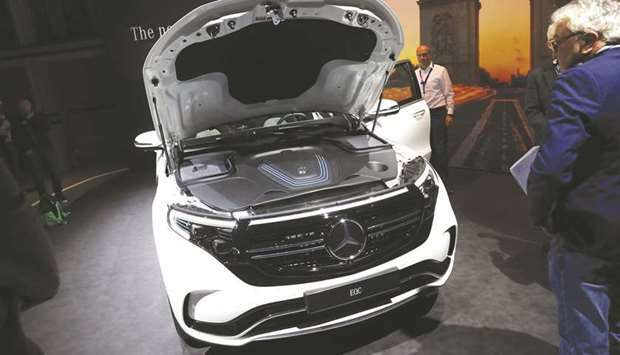 A battery unit sits under the hood of a new Smart Forease compact electric automobile, manufactured by Daimler, during the Tomorrow in Motion event ahead of the Paris Motor Show on October 1. Every major carmaker has plans for electric vehicles to cut greenhouse gas emissions, yet their manufacturers are, by and large, making lithium-ion batteries in places with some of the most polluting grids in the world. Beneath the hoods of millions of the clean electric cars rolling onto the world’s roads in the next few years will be a dirty battery. Every major carmaker has plans for electric vehicles to cut greenhouse gas emissions, yet their manufacturers are, by and large, making lithium-ion batteries in places with some of the most polluting grids in the world. By 2021, capacity will exist to build batteries for more than 10mn cars running on 60 kilowatt-hour packs, according to data of Bloomberg NEF. Most supply will come from places like China, Thailand, Germany and Poland that rely on non-renewable sources like coal for electricity. “We’re facing a bow wave of additional CO2 emissions,” said Andreas Radics, a managing partner at Munich-based automotive consultancy Berylls Strategy Advisors, which argues that for now, drivers in Germany or Poland may still be better off with an efficient diesel engine. The findings, among the more bearish ones around, show that while electric cars are emission-free on the road, they still discharge a lot of the carbon-dioxide that conventional cars do. Just to build each car battery—weighing upwards of 500 kilograms (1,100 pounds) in size for sport-utility vehicles—would emit up to 74% more C02 than producing an efficient conventional car if it’s made in a factory powered by fossil fuels in a place like Germany, according to Berylls’ findings. Yet regulators haven’t set out clear guidelines on acceptable carbon emissions over the life cycle of electric cars, even as the likes of China, France and the UK move toward outright bans of combustion engines. “It will come down to where is the battery made, how is it made, and even where do we get our electric power from,” said Henrik Fisker, chief executive officer and chairman of Fisker Inc, a California-based developer of electric vehicles. For perspective, the average German car owner could drive a gas-guzzling vehicle for three and a half years, or more than 50,000 kilometres, before a Nissan Leaf with a 30 kWh battery would beat it on carbon-dioxide emissions in a coal-heavy country, Berylls estimates show. And that’s one of the smallest batteries on the market: BMW’s i3 has a 42 kWh battery, Mercedes’s upcoming EQC crossover will have an 80 kWh battery, and Audi’s e-tron will come in at 95 kWh. With such heavy batteries, an electric car’s carbon footprint can grow quite large even beyond the showroom, depending on how it’s charged. Driving in France, which relies heavily on nuclear power, will spit out a lot less CO2 than Germany, where 40% of the grid burns on coal. “It’s not a great change to move from diesel to German coal power,” said NorthVolt AB CEO Peter Carlsson, a former Tesla manager who is trying to build a €4bn ($4.6bn) battery plant in Sweden that would run on hydropower. “Electric cars will be better in every way, but of course, when batteries are made in a coal-based electricity system it will take longer” to surpass diesel engines, he said. To be sure, other studies show that even in coal-dominant Poland, using an electric car would emit 25% less carbon dioxide than a diesel car, according to Transport & Environment Brussels, a body that lobbies the European Union for sustainable environmental policy. The benefit of driving battery cars in cities will be immediate: their quiet motors will reduce noise pollution and curb toxins like nitrogen oxide, NOX, a chemical compound spewed from diesel engines that’s hazardous to air quality and human health. “In downtown Oslo, Stockholm, Beijing or Paris, the most immediate consideration is to improve air quality and the quality of life for the people who live there,” said Christoph Stuermer, the global lead analyst for PricewaterhouseCoopers Autofacts. But electric cars aren’t as clean as they could be. Just switching to renewable energy for manufacturing would slash emissions by 65%, according to Transport & Environment. In Norway, where hydro-electric energy powers practically the entire grid, the Berylls study showed electric cars generate nearly 60% less CO2 over their lifetime, compared with even the most efficient fuel-powered vehicles. As it is now, manufacturing an electric car pumps out “significantly” more climate-warming gases than a conventional car, which releases only 20% of its lifetime C02 at this stage, according to estimates of Mercedes-Benz’s electric-drive system integration department. Some manufacturers have heeded calls to produce batteries in a more sustainable way. Tesla uses solar power at its Gigafactory for batteries in Nevada, and has plans for similar plants in Europe and Shanghai. Chinese firm Contemporary Amperex Technology Co is also looking to power its future German plant with renewables.